Many moons ago, all fake plants were removed from our house. The other day I was at a girlfriend's house and she had some really pretty faux flowers that definitely caught my eye here in the dead of winter. So when we went to Canton she helped me find these little pretties. right now. The aqua vase has been hidden in a bathroom upstairs. I'm happy to have it out here in the entry for awhile. Ann, the flowers were found at The Cotton Shed in Downtown Canton. So here's the lesson today - copy your girlfriends. Love your pretty flowers. They do look real. Hi Stacey! I love your pretty fauxs. Now me, I love these puppies and have them all over the place and change them out occasionally. Hope you're continuing to heal and feel better. Some "faux" flowers and greenery are really beautiful. I have a few and am so glad that I cannot kill them, as I've done with some of the real things! Hope this finds you feeling well. Your flowers look real! So pretty in that vase. So here's one more lesson today - read creative blogs. I am not convinced we should get rid of all faux plants. I got rid of most, cleaned ALL and, well, it's winter and we need the look don't we? Every room should have some green. Most of our rooms have some real plants but some are too dark so occassionally I get out pretty faux ones I keep stashed for such an occasion. I ADORE your new one, and yes, it is very nice to copy great ideas. Glad your friends "helped" you brighten up your world a little bit. BTW- love love love that bird plate you have standing up, that's AWESOME! Stacey - That's a bright spot in this dreary old weather. Looks great! Personally, I like the look of something living, even if it's faux!! :) Very pretty vignette! I still have a few fake vines around I confess, but I like the flowers you found. I forget to water the real ones. Any advice on what I need to do to not show up as no reply blogger? Sometimes you just need a little greenery. These look so pretty & complement the aqua vase so nicely. love those faux flowers!! so pretty, Stacey and love that vase, too! What pretty delicate flowers and leaves. I like silk flowers...but only a few and not the big colorful blooms. But that might change. lol If something catches my eye, I might add it to my home. I might even copy YOU! Hugs! Before I spend days walking all over Canton looking for these could you give me some general idea where you found them? Building? Thanks! They are probably the most realistic I've seen in a while. 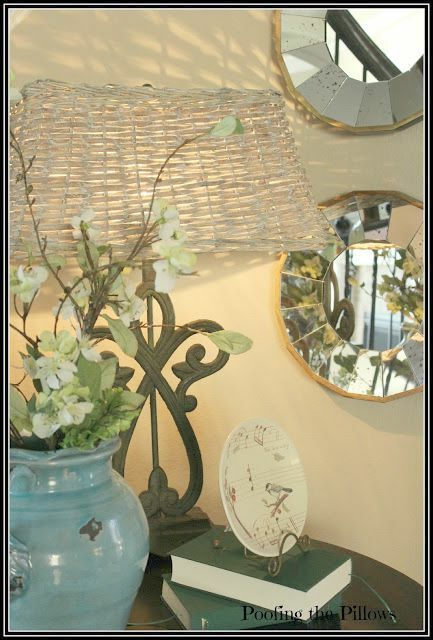 So pretty Stacey...love that pretty lamp and seagrass shade too! 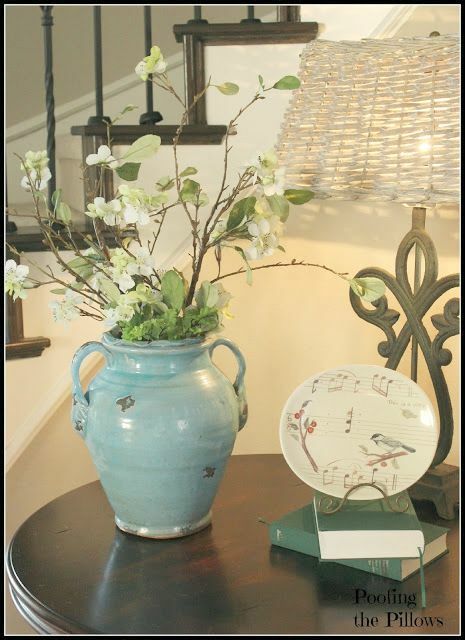 Love those dainty little flowers, and the vase that gathers them so beautifully! You know, I've been noticing lately that they're starting to make very realistic faux flowers now days. Love yours and that vase is perfect for them! I stopped in to get some TX sunshine on a snowy day, Stacey! :) What a pretty arrangement! Looks like Spring. I like faux plants & make silk flower arrangements for all seasons. Very pretty! I always use fake flowers - never stopped. Even certain ones from the dollar tree look pretty good. I think that fake flowers today are not the same as fake flowers years ago. Hi Stacey, lovely little blossoms and they certainly warm up our cold day. We went from 80 to freezing here in Dallas!! But the good news is back to near 80 this weekend, I hope!! Your flowers are beautiful. They look real! I could use a sprig or two of something just like that in several places in my home. Looks just perfect to me! Hope you're continuing to improve and feeling stronger every day! I said goodbye to faux years ago, Stacey, just like you. I only used them on the front door and one wreath in my kitchen. However, this past year, they have crept back into my house...twice! Yours look real! The flowers look real, and when they do, it always adds to a décor. Yours look so good in that vase, and I especially like the mirror that you have with it. It offers a warm welcome. Your flowers look beautiful. I was convinced they were real. I love it, Stacey! The blooms go so well with your bird plate, too. It is like a tease of Spring for us getting snow. : ) I have to have faux plants here. Ever since we moved my indoor green thumb has turned black. Those are lovely! And I adore this mirrors!! Those are very pretty and real looking! Love the little song bird plate too! You are so funny! I love your comments about "sticking your nose up in the air" and "copying your girlfriends!" Your faux flowers are lovely. I have good faux mixed with a few real here and there. The faux greens/flowers have gotten so realistic the past few years that it's hard to pass them up for the winter.